Can you really roof in the winter? The first are the logistical concerns that come along with freezing temperatures and unpredictable weather. Roofing requires certain tools and some, like compressors and nail guns, can be affected by the cold. When compressing and releasing the air in your system, humidity will turn into water. If the temperature is freezing, the water may freeze in the airlines and reduce the airflow that the installer receives on the roof. Nails needs to be installed flush with the shingle, not overdriven or under driven. When the airline is obstructed by ice, nails may not be pushed as deep as they should, which introduces a risk for under driven nails. Morale in roofing is very important, as it is in many other trades—when people hate their job, they cut corners. Especially if those corners can make them go home faster! Starting the day shoveling and ice-breaking on the roof doesn’t help the morale of the crew. Roofing is also very physically demanding and because of the need to use your fingers precisely and bend your toes, a contractor can only wear small gloves and boots. 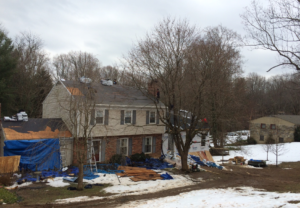 For most roofers, it is uncomfortable below freezing and impossible below 20°F and probably not smart to proceed. Trust your contractor. We’ve been doing this for over 26-years and we know the capabilities of our crews and equipment. Furthermore, we warrant our work for 10-years, so we would never put on a shoddy roof. If your contractor is properly certified, has customer references, a strong warranty and you trust them enough to install your roof, you should also trust their judgment. If you have doubts, feel free to contact us for a second opinion.